In a large bowl, whisk together eggs, cream, salt, and pepper. Sauté mushrooms in butter over medium heat until soft; about 3 minutes. Add a splash of brandy or sherry and continue to cook until the alcohol has burned off, another 3 minutes or so. Remove from heat and set aside. Sprinkle the bottom of a pie crust with a bit of the shredded cheese, enough to cover the bottom in a thin layer. 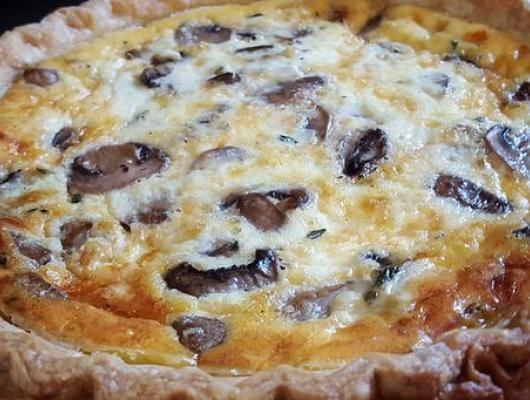 Add mushrooms and thyme leaves in an even layer to the pie crust. Bake quiche on the bottom rack of a preheated 350° F for 50 minutes or until a knife inserted in the center comes out clean. 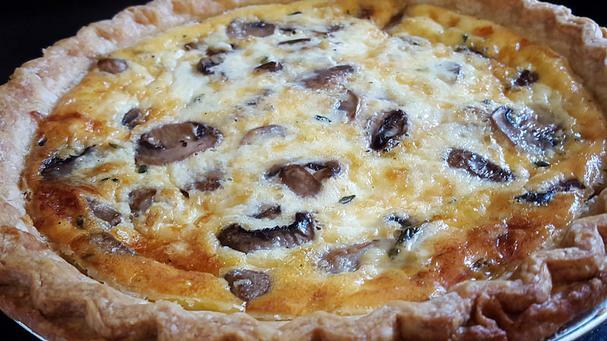 Let quiche stand 15 minutes before serving. Use 11 large eggs total and 4 cups heavy cream.